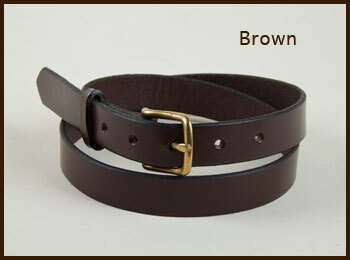 The most high-quality, long-lasting leather belt out there! These American-made belts are built 100% from 8-9oz. solid straps of cowhide with high-quality metal hardware—no synthetic materials or plastic pieces involved. These belts are built to last. To determine which size of belt you should order, measure the length of your current belt in inches from the end of the buckle to the hole you normally wear it in. (See diagram above.) 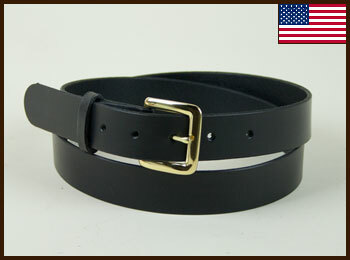 This will be the size of belt you should order. Please measure carefully! We will use this information to make a belt for you. The measured number will be the center hole in a five-hole pattern where the holes are one inch apart. If you are unsure of your size, please don’t hesitate to contact us! These belts come in three widths: 1 in., 1.25 in., and 1.5 in.